Join us for the USA Science and Engineering Festival in Washington, D.C.! 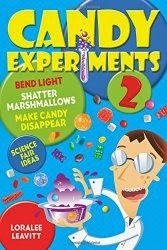 We'll be demonstrating candy experiments at the Finale Expo on April 28-29. Kids will love learning about hidden candy in different foods, dropping Warheads into baking soda water to watch them bubble, making "M&M Rainbows" with chromatography, and competing to see who can sink a marshmallow. Besides candy experiments, you'll be amazed at the science activities you can do. At the first USASEF, we built model boats, tested paper airplanes in the NASA wind tunnel, extracted strawberry DNA, admired Purdue University's solar car, watched Bill Nye spread out a solar sail, and used remote controlled robots to play soccer. This year you'll also see stage shows like the Mythbusters' forays into the unexplained, demonstrations of physics in the movies, and presentations by scientists in all different fields. We need all the help we can get! Please consider signing up for a two-hour shift to help us teach candy experiments at our booth. You'll learn experiments you can use later at home, you'll make a lot of kids smile, and you'll get a free Candy Experiments t-shirt if you sign up before April 1. Email me if you're interested; I'd love to hear from you!